A rootin’ tootin’ good time! 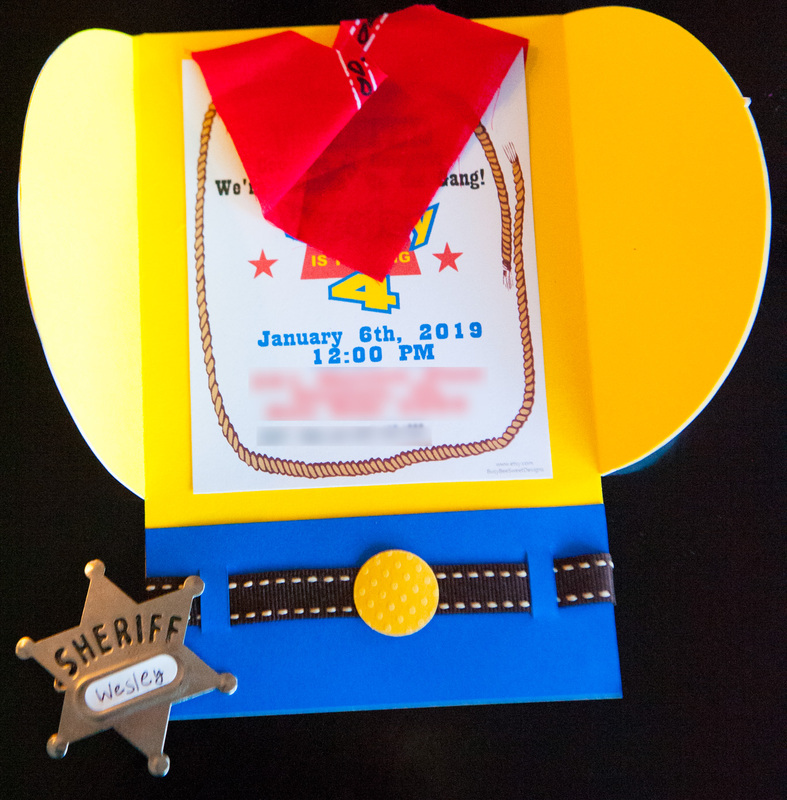 Invitees were send this invitation (purchased on Etsy here) that gave them a preview of the Toy Story party that was coming their way. 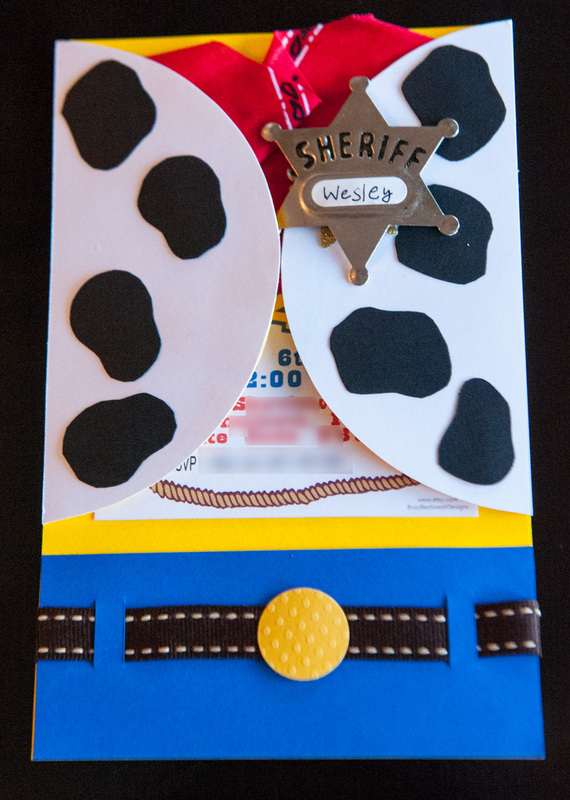 Personalized and removable sheriff badges give the kids something fun to play with after the invitation is opened. We selected yellow, light blue, red, and orange for the Toy Story Theme. 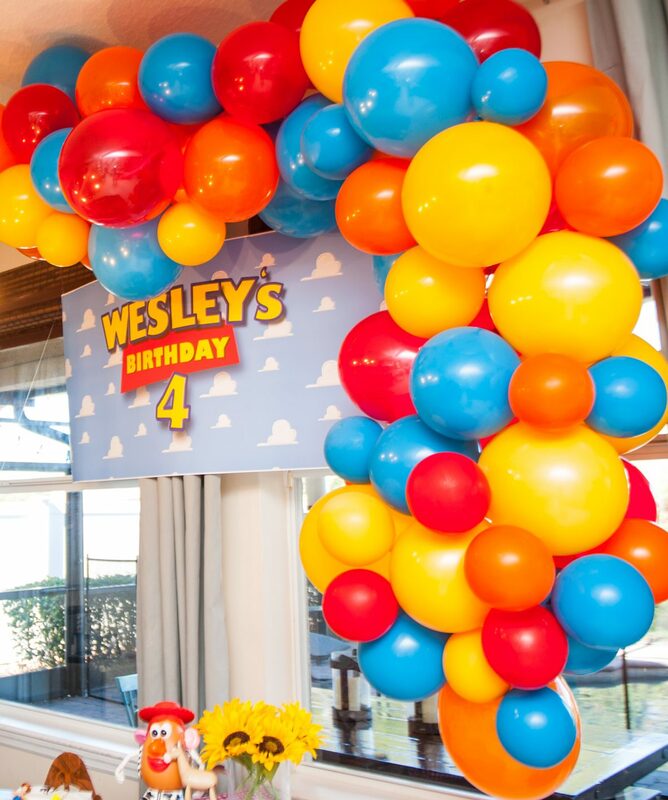 Among the ways in which we incorporated the color theme was the use of balloons and printables. 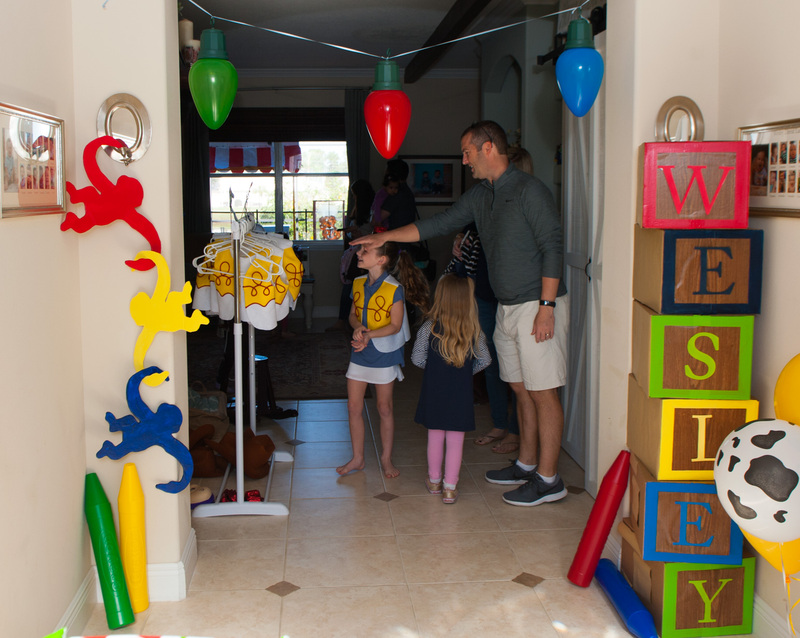 This colorful balloon arch was surprisingly easy by stringing large and medium balloons together with fishing line (instructions coming soon). Our banner was purchased on Etsy here and printed at Staples. Our color scheme was inspired by the Toy Story printables that you will discover below. 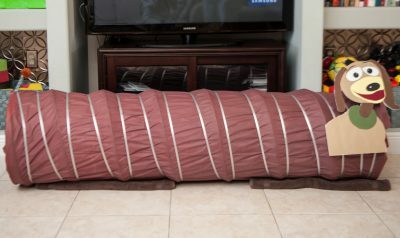 We wanted to include the iconic bed from Andy’s room. The cake was a fun way to display this bed and was relatively easy to make. 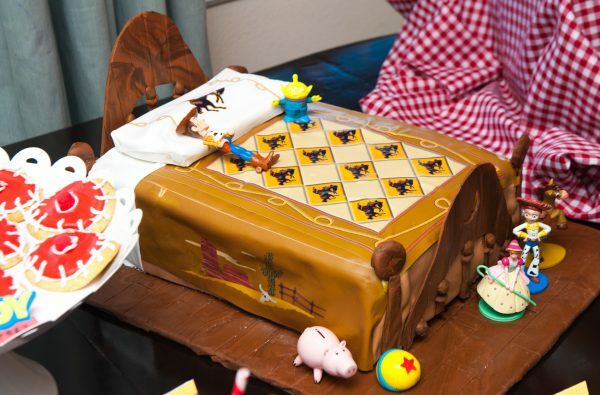 The headboards are made from dried fondant, and the the bedding was added by using printed edible images. The ball and pillow are also made from fondant and printable sheets. The cake was a chocolate fudge cake with salted caramel and chocolate ganache from the Baked cookbook. Find out how to bake cakes your guests will rave about here. 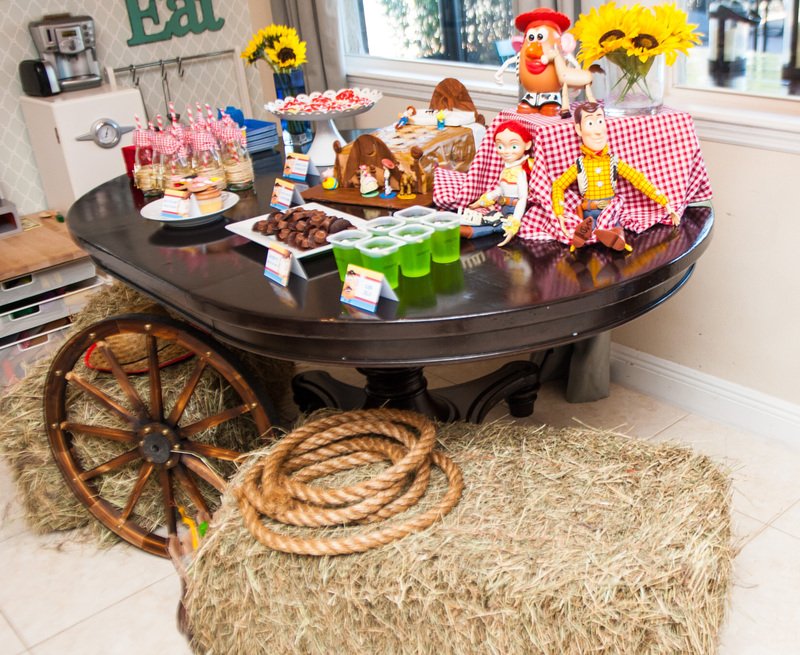 We created a cowboy-themed dessert table that Woody and Jessie would give a thumbs up! Find baled hay at your local feed store and wagon wheel at hobby stores or on Amazon here. 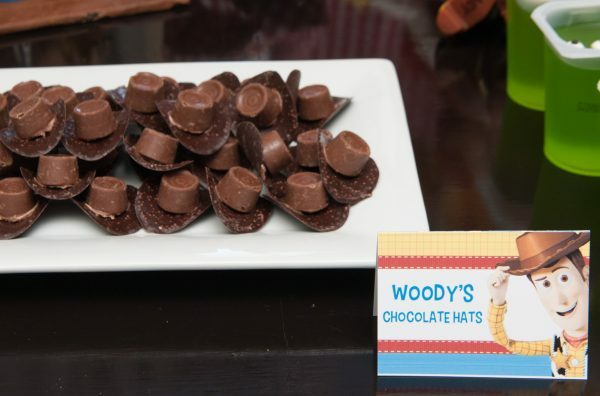 Easily create cowboy hats by attaching Rolos candies on top of chocolate “Pringle-like” chips. I found the bottom part of the cowboy hat at Trader Joes. To attach these two pieces together, quickly melt the bottom of one Rolo in a pan on low heat and when the bottom melts slightly, attach it to the “Pringle” chip. 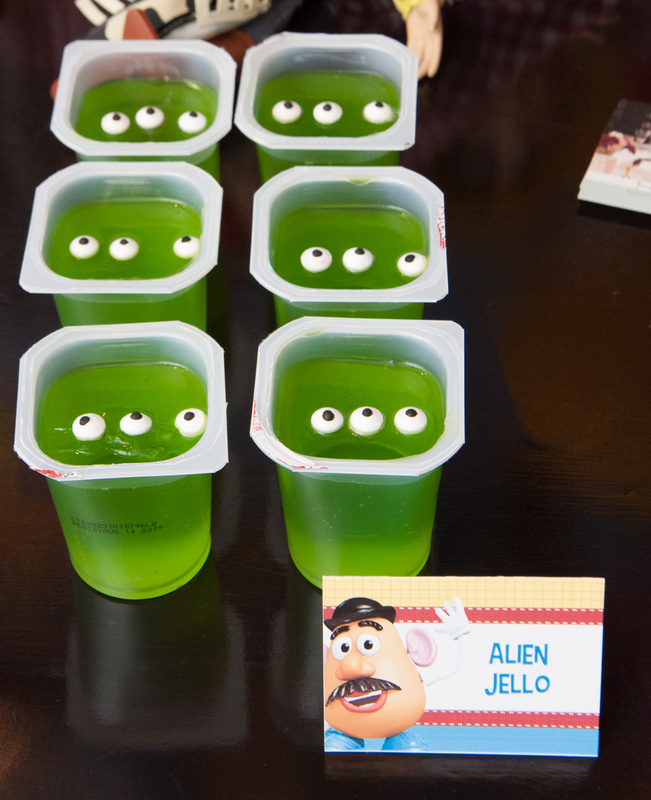 Store bought Jello are transformed into alien Jello by adding edible eyes! We turned red sugar cookies into Jessie hats. We discovered this novel idea by visiting the Disney Family website. 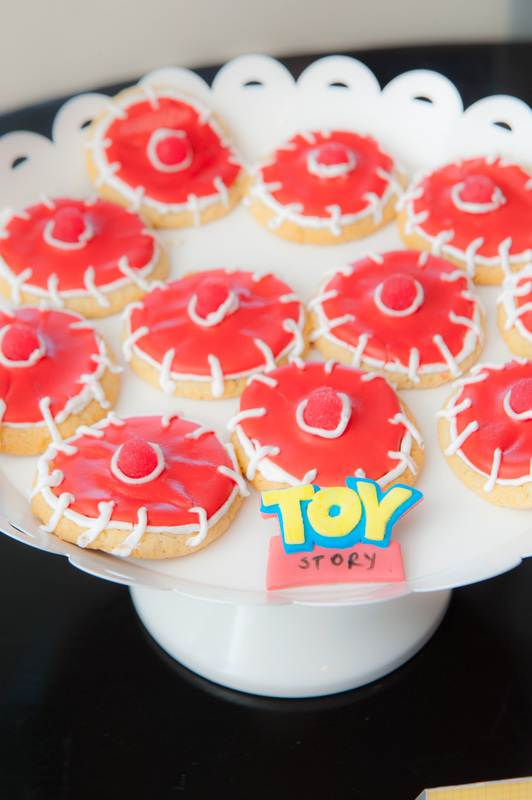 If you have a Disney party, visit this website because you’ll find a wealth of great ideas! You will find complete instructions on how to make these hats here. 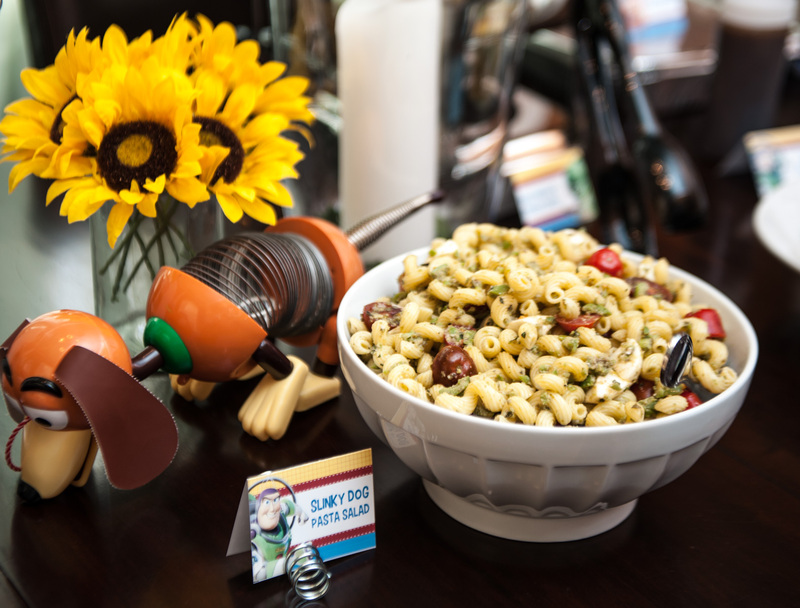 Since we incorporated a cowboy theme with Woody and Jessie, sunflowers were a fittin’ flower. This flower class will inspire you to always add flowers to your parties. 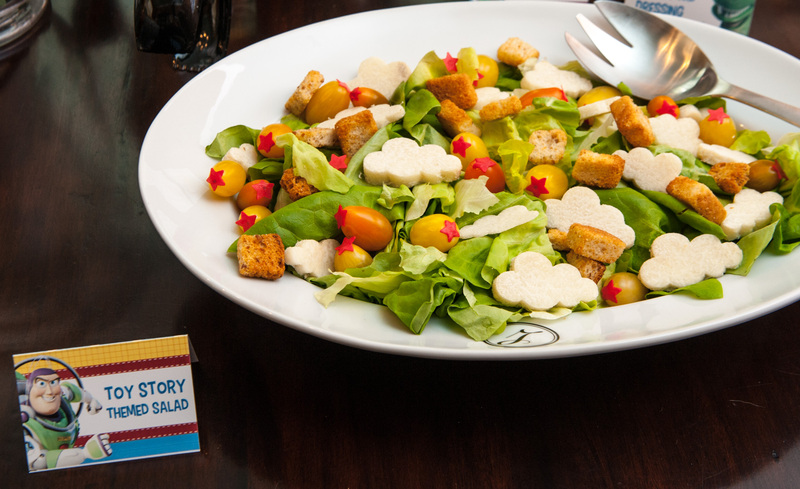 Our Toy Story salad includes Toy Story clouds cut from jicama, the iconic yellow balls (yellow tomatoes with edible stars), bib lettuce, and croutons! 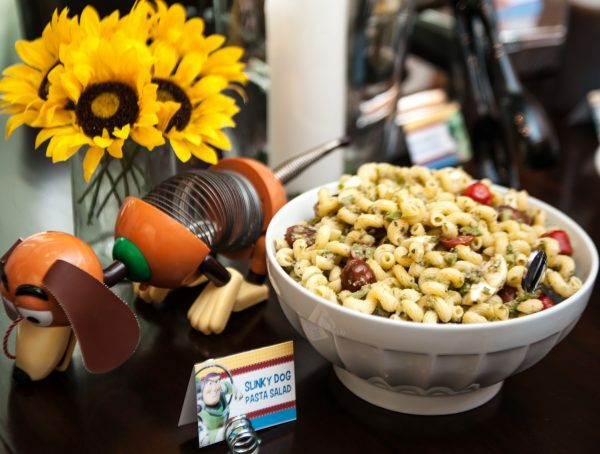 Corkscrew pasta = Slinky Dog pasta! 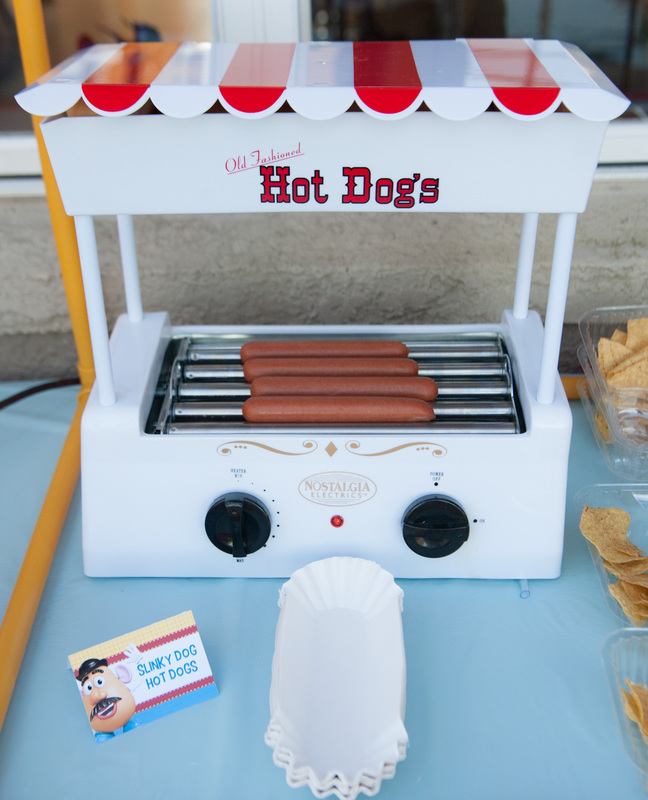 See the picture below–serve your Slinky hot dogs in this darling hot dog roller and bun warmer. 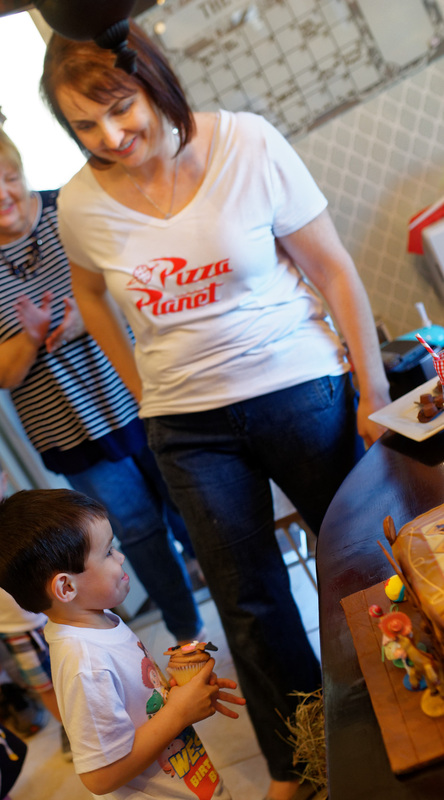 No Toy Story Party would be complete without pizza from Pizza Planet! Kids created their own pizzas with their favorite toppings. We made pizza crusts ahead of time and par-baked them (meaning we baked them until done but not golden brown). 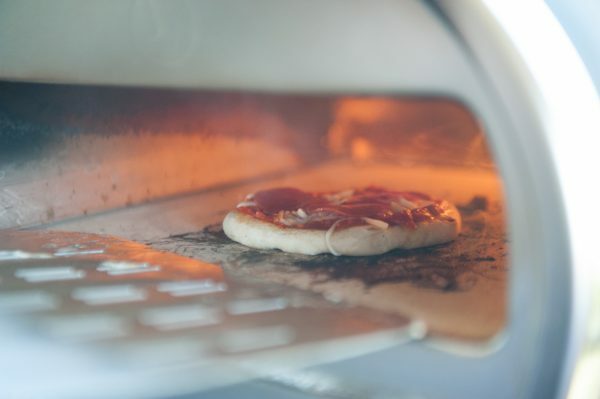 Par-baking makes the pizza dough easier for little ones to handle instead of using sticky raw pizza dough. Alternatively, you can find small baked pizza crusts at your local grocery store. If you’re interested in becoming a pizza pro check out this excellent pizza class! Time to bake the pizzas in our favorite Roccbox pizza oven! 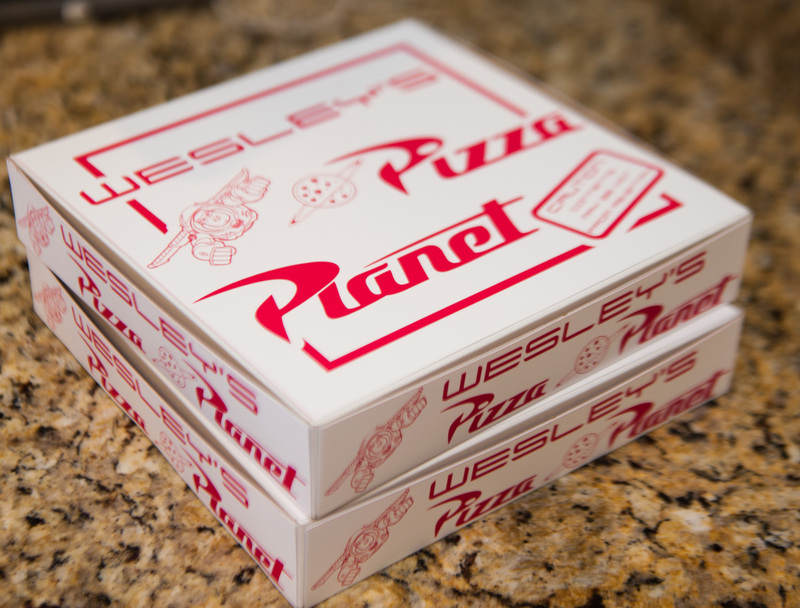 As the piping hot pizzas came out of the oven we placed them into unique homemade pizza boxes. The pizza box template is found on Etsy here. 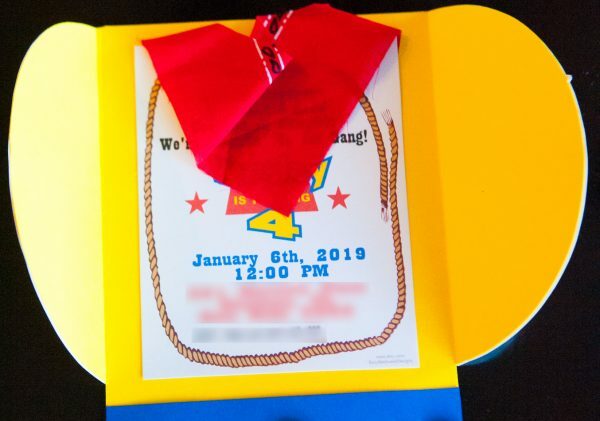 We enlarged the image for a bigger box and added my son’s name to the template. Print and cut the design and then tape the design on white pizza boxes found on Amazon. 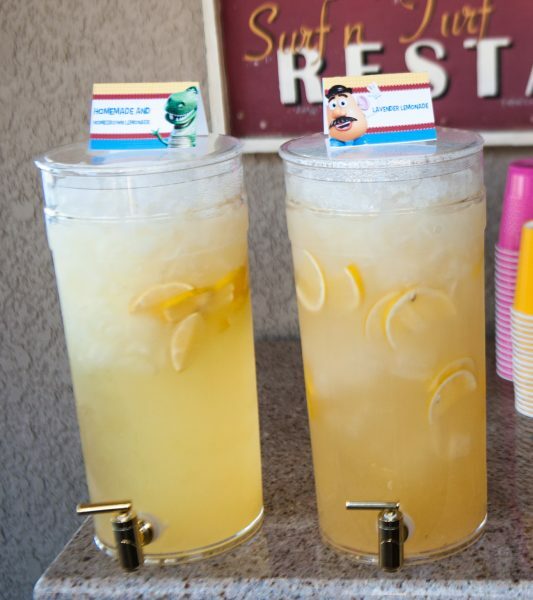 We served homemade lemonade and lavender lemonade from the lemons from our trees. Fun cowboy glasses are made by hot glueing rafia to empty Starbucks glasses. We attached Sheriff badges, tied on red gingham ribbons, and adorned the bottles with a red striped straw. Children were able to create their own Mr. Potato or Mrs. 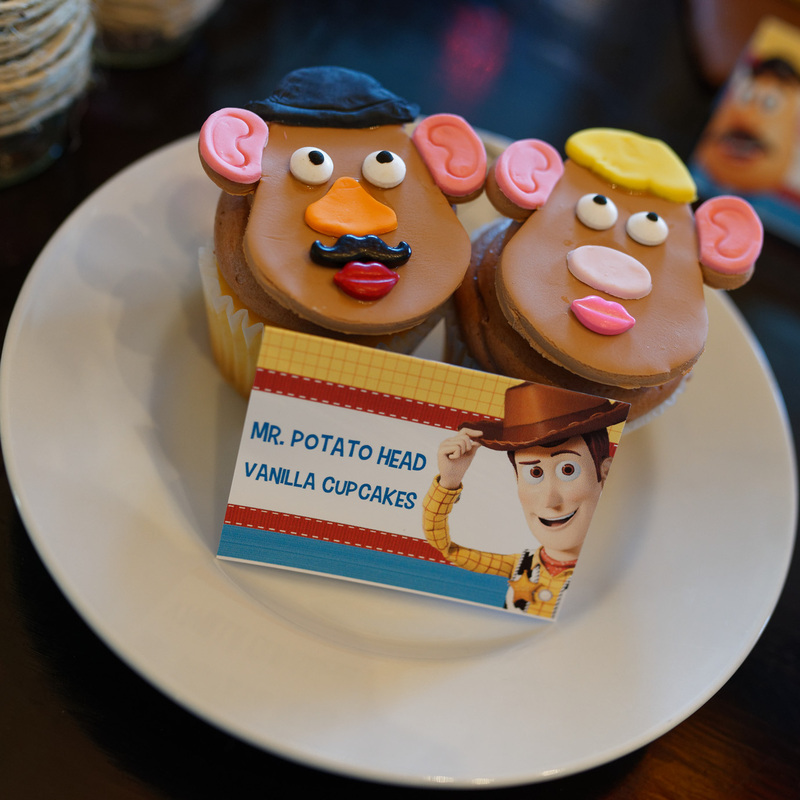 Potato head cupcakes. We purchased vanilla cupcakes and instructed the bakery to frost the cupcakes with a light brown frosting. At home we cut out colored fondant pieces for the body, nose, ears, hat, and hair and let them dry. Amazing cutters for Mr. Potato head can be found here. The eyes, moustache and mouths can be purchased here. 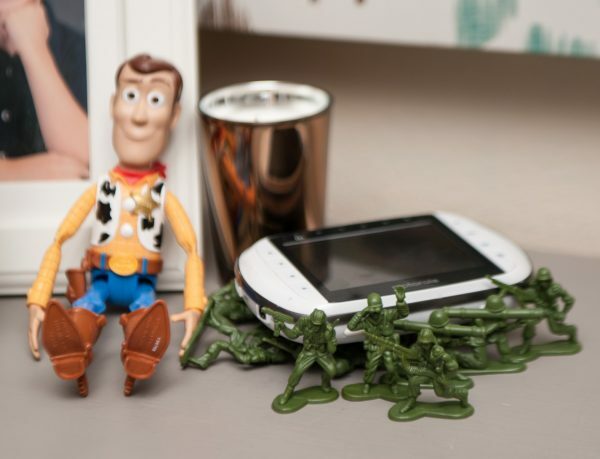 Enter our Toy Story world! 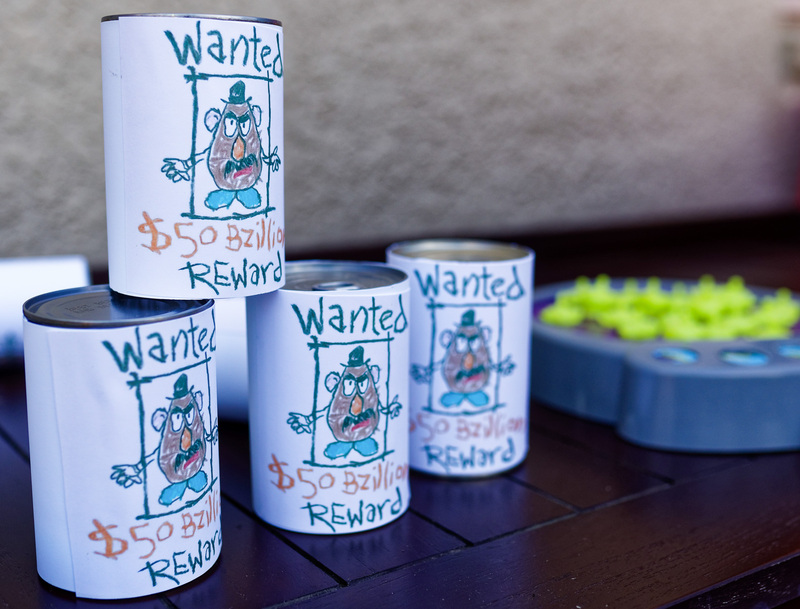 Use your Cricut to make a paper chain with several cut-out rectangles. Find an image of a claw and add two more claw arms to make it 3D. 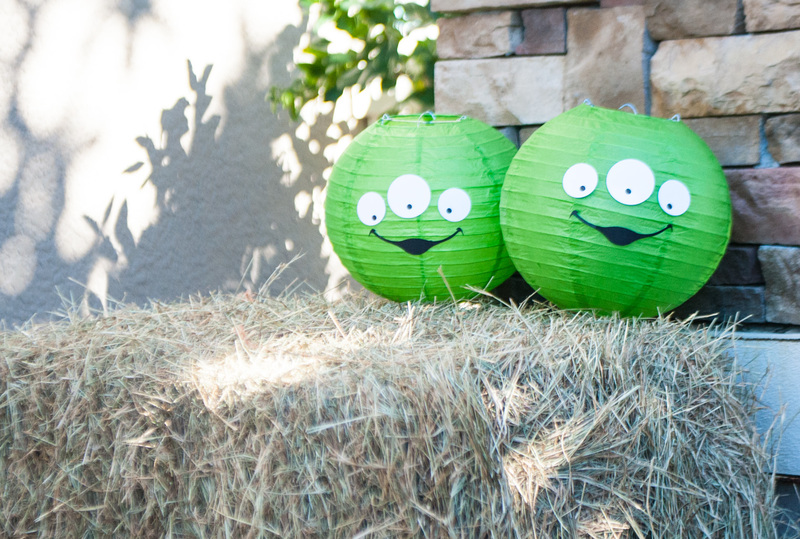 Green paper lanterns become aliens with cut-out eyes and mouths on our Cricut machine. Our little guests loved being greeted by these aliens! Use this alien face template to help you create the alien faces. Large cardboard boxes are transformed into blocks by attaching wood contact paper in the front and attaching colored letters cut out on my Cricut machine. We made the monkeys by painting foam board and cutting it out with an exacto knife. A simple sharpie and white paper creates aliens and rocket balloons! 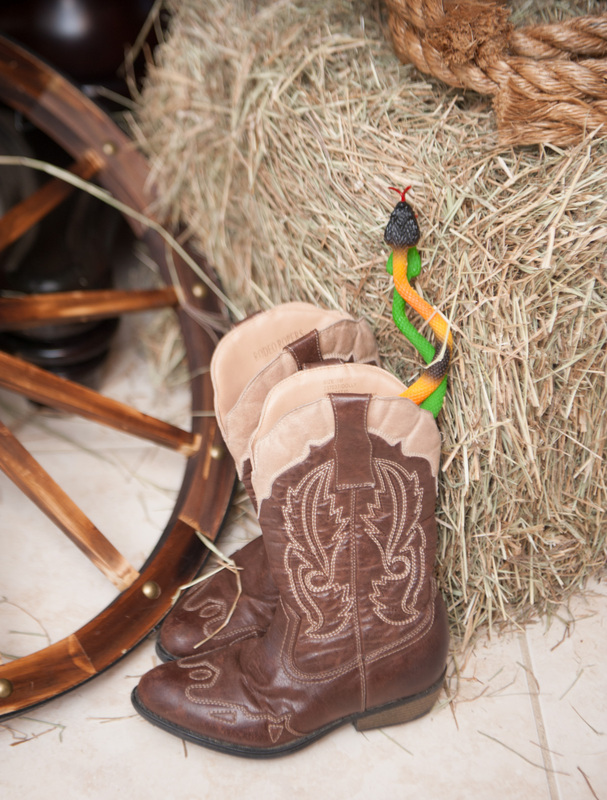 There is a snake in my boot! 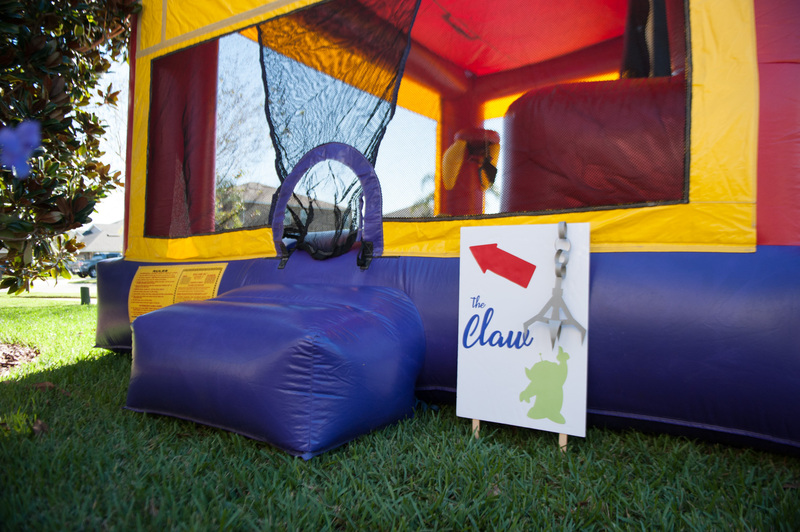 We created the worlds largest claw machine with our bounce house! 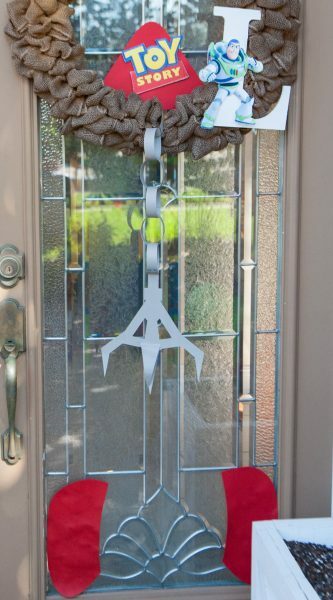 This image found on Etsy helped me create the sign. 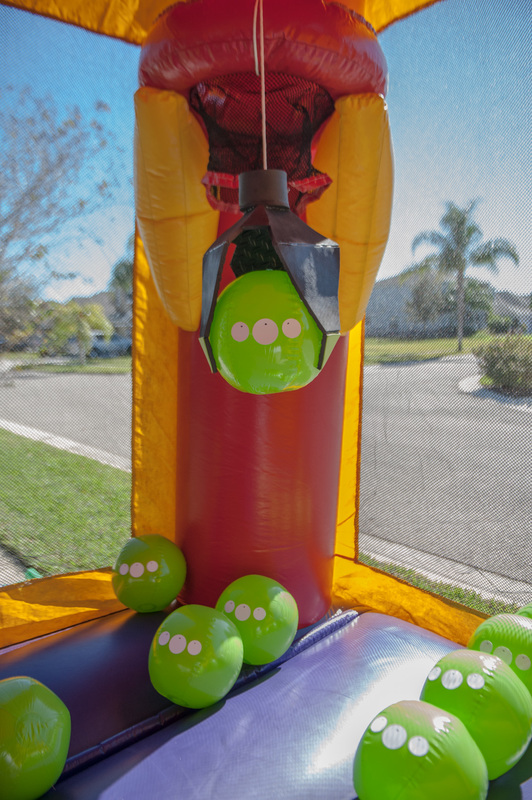 A large claw was attached to the basket ball hoop and green beach balls became aliens by attaching eyes. The kids were in awe when they discovered they could jump in the middle of all this fun! Do you want to be Woody, Buzz, or Jessie? Choices can be hard sometimes when dealing with such cute Disney characters! My mom made these for us out of felt, but you can also find similar ones on Etsy here. 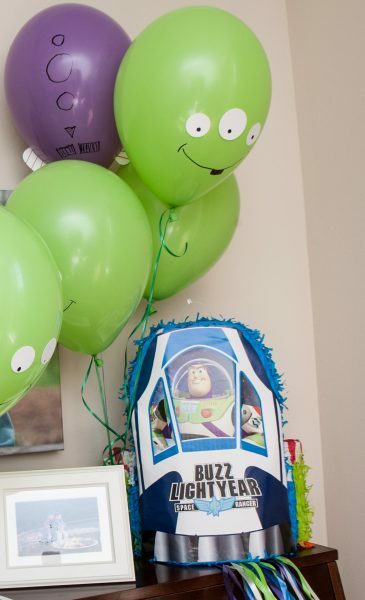 The Buzz Lightyear wings can be inflated and strapped on. 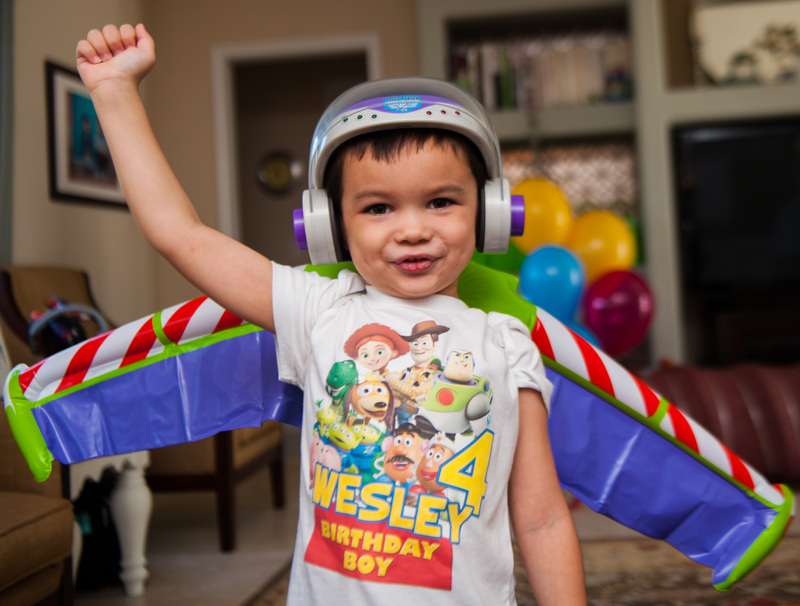 Our birthday boy decided that he should be Buzz Lightyear! Wesley’s shirt image can be found on Etsy here. Print your image on this iron on paper and either use on iron to attach to your shirt or a Cricut heat press. 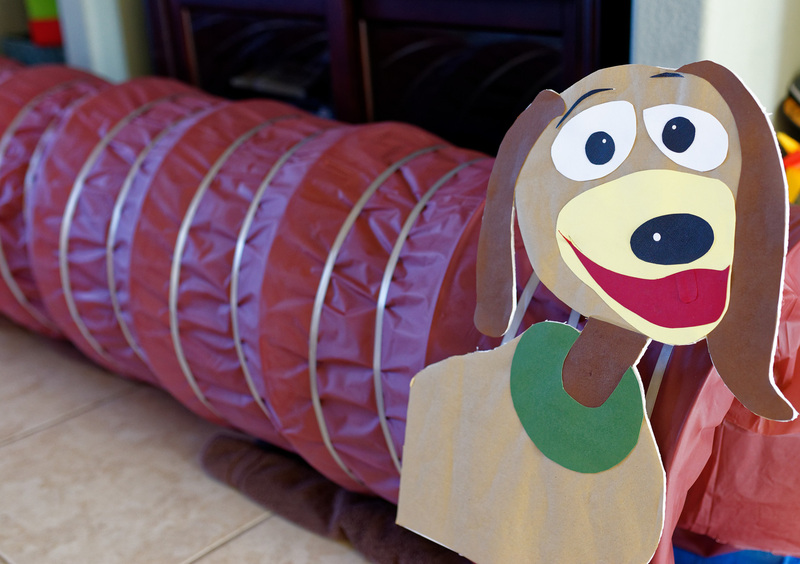 We transformed our tunnel (from Gymboree) into a Slinky Dog tunnel! 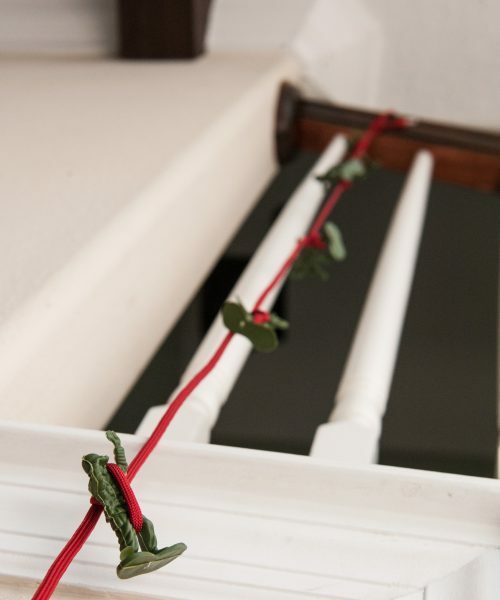 We achieved this by wrapping a plastic table cloth around the tunnel and then placed silver ribbon on top of the table cloth to look like the spring. 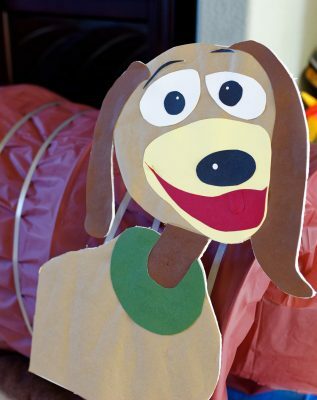 The Slinky Dog face was made on our Cricut and then was glued onto foam board. A large metal coil and brown cotton ball can be found on Amazon to make Slinky’s tail. 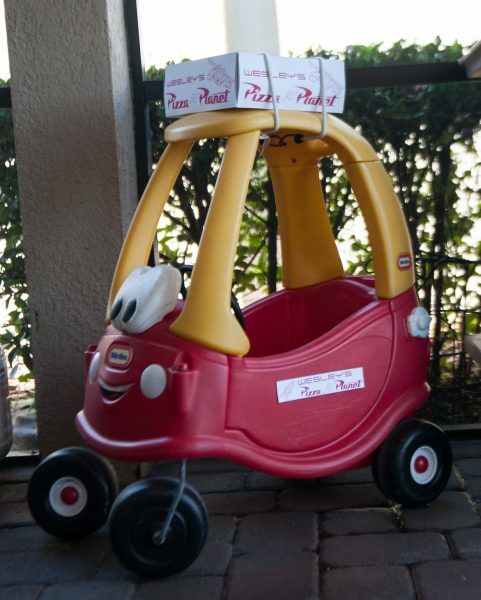 The kids had their own Pizza Planet delivery car! The pizza box was attached with bunjee cords. 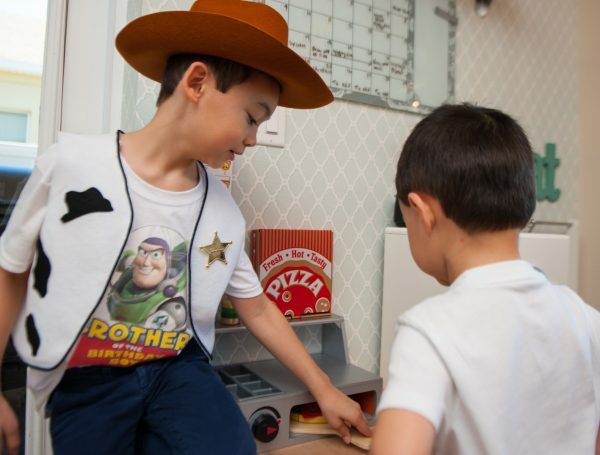 Welcome to our version of Toy Story Mania! 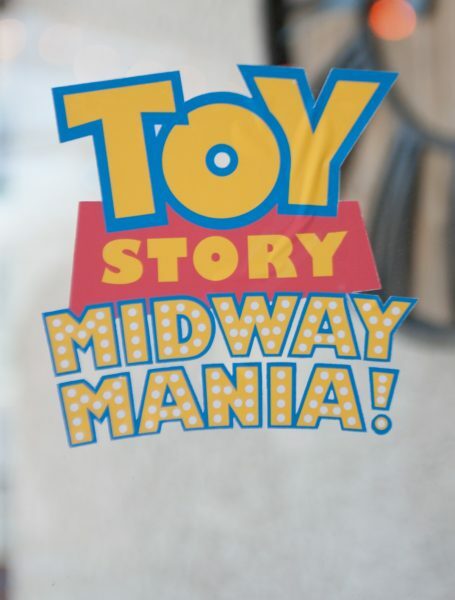 We made two Toy Story Mania printed vinyl stickers (with the print and cut option) on our Cricut. 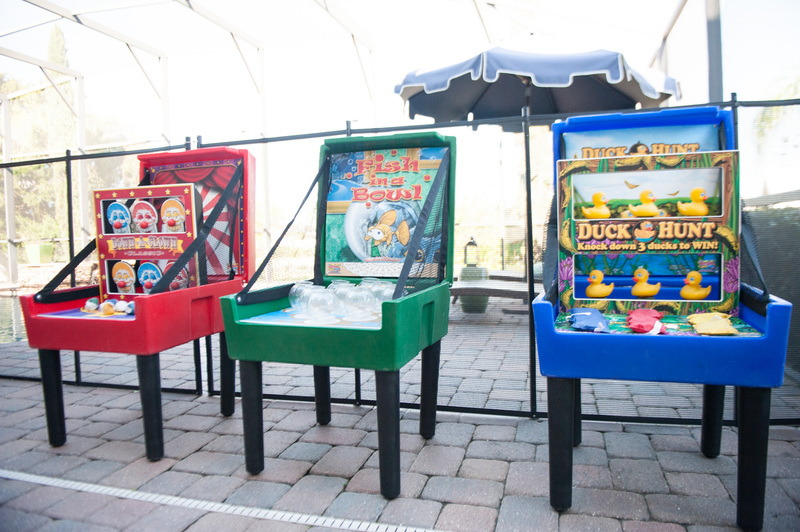 Both of our glass doors proudly displayed these stickers so that the guests knew once they passed through the doors, they would immersed in a carnival setting. Below you will see our carnival games, food and fun! 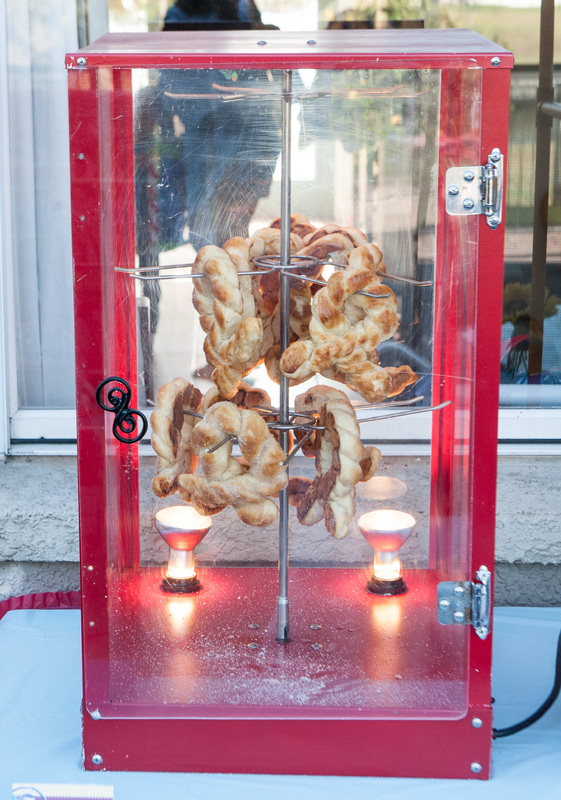 Woody’s lasso is represented in these soft pretzels. My favorite recipe for soft pretzels comes from this book. We made cinnamon sugar lassos and salted pretzels with cheese dip. Alien cotton is created by printing edible images for the eyes, using green floss sugar, and a green honey stick with a green M&M. Before the party, I attached the M&M to the honey stick and let it dry. 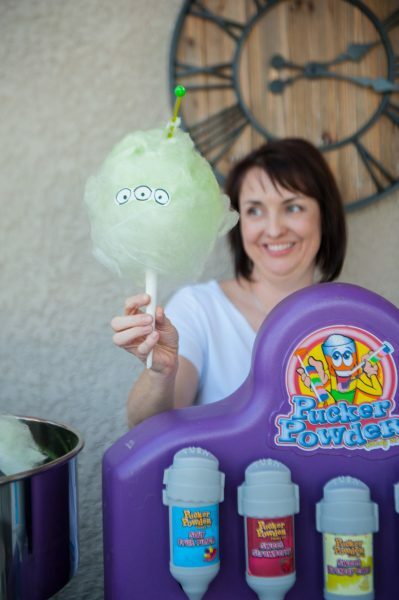 Do not try to make the cotton candy ahead like I did! It dissolved in the bag! Hmm– lessons learned! This rocket was downloaded from Etsy here and then printed out at Staples. 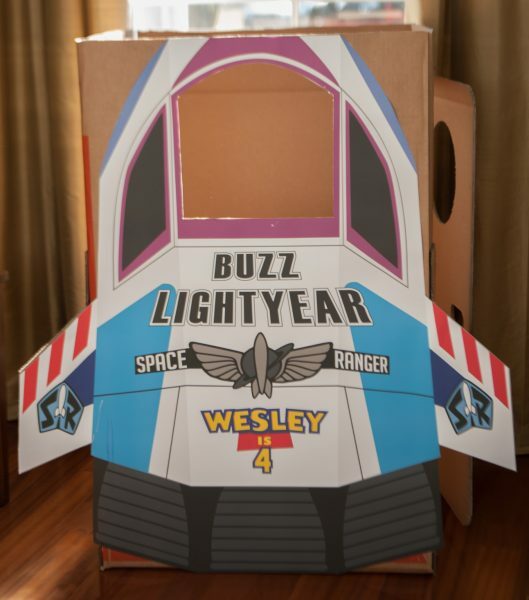 After you cut out the rocket, you can place it on a large wardrobe box so that the kids can enter the spaceship. A door was placed on the side of the box for easy entry. 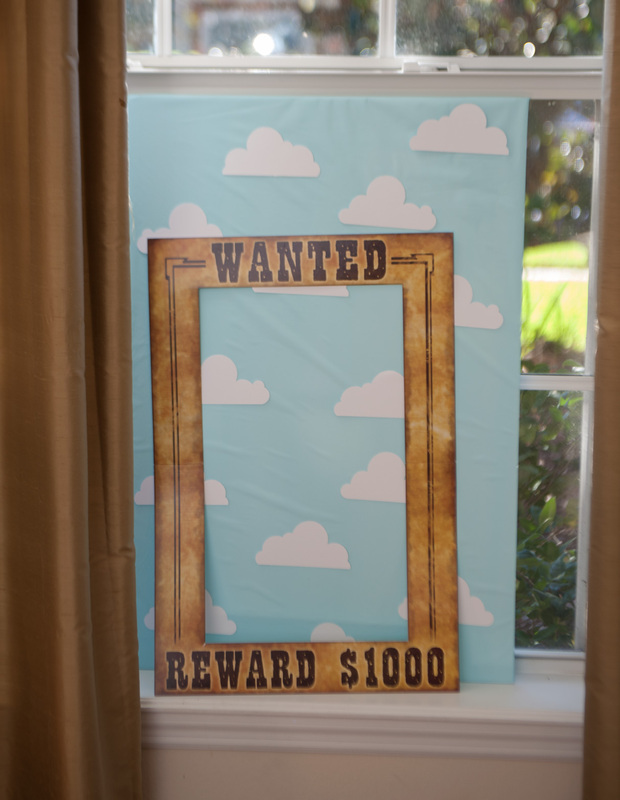 Make a photobooth by covering a large foam board with a light blue table cloth and adding white clouds cut out on your Cricut. 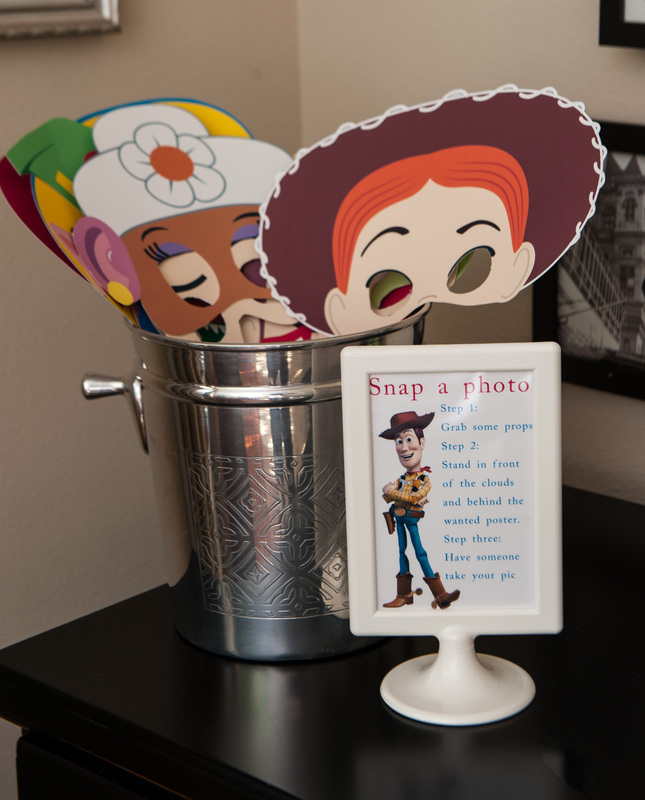 The Wanted sign and character masks were fun for each guest. We discovered these great masks on Etsy here. 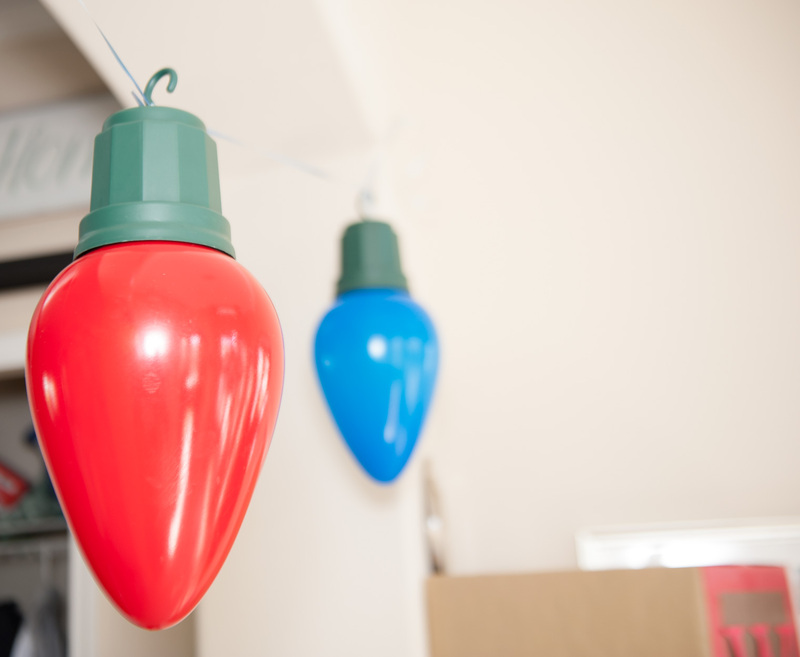 Cut them out and attached to a paint stick. 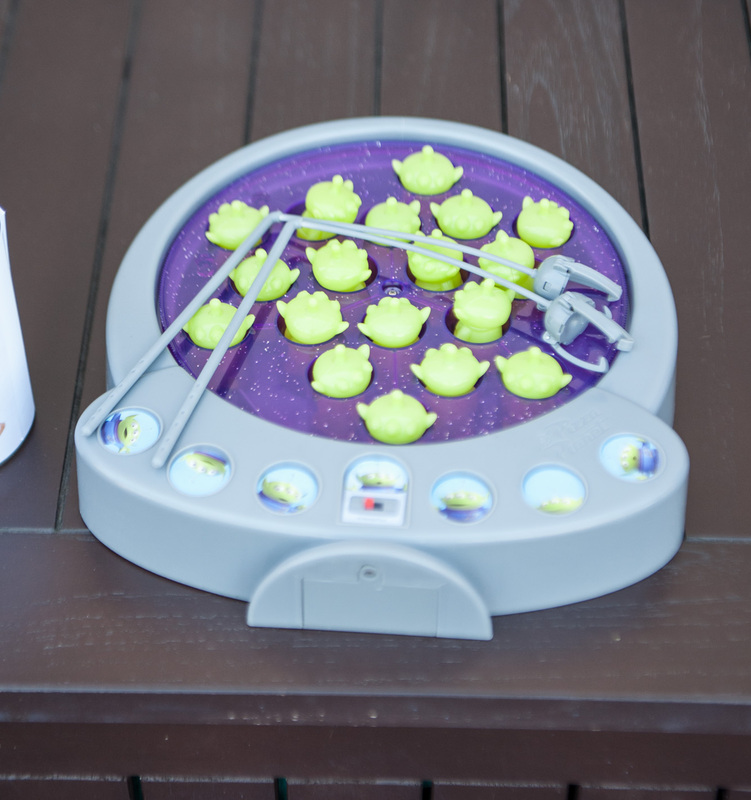 We found the sweetest pizza play set from Melissa & Doug on Amazon that tied in our Pizza Planet fun! Daddy received a shirt here and Evan’s shirt can be found on Etsy here. 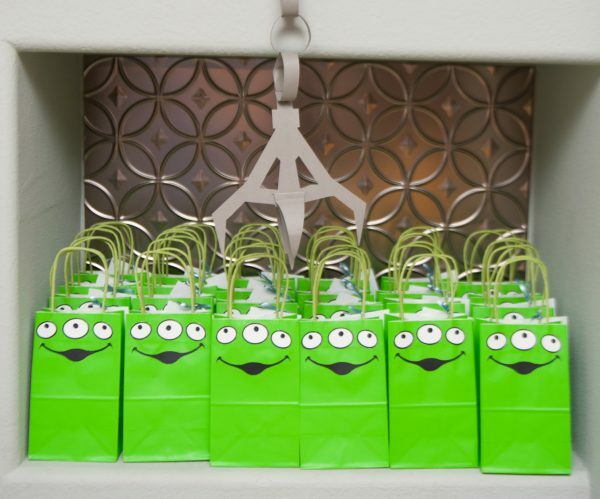 We made our guests work for their favors by using the claw to grab special items for their goodie bags. Happy birthday Wesley!! Easily make my shirt by cutting everyday iron-on on your Cricut Explore Air™ 2 machine. 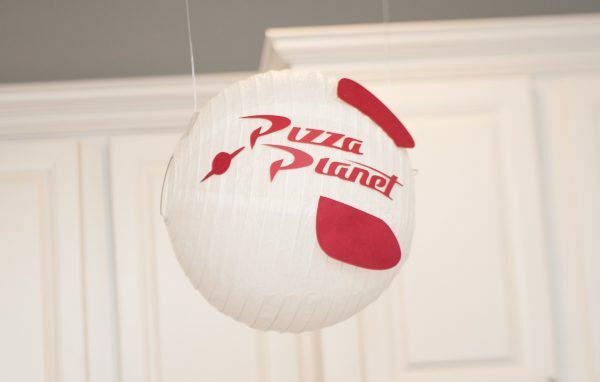 Cricut Design Space™ will allow you to download images like Pizza Planet and then cut them out! 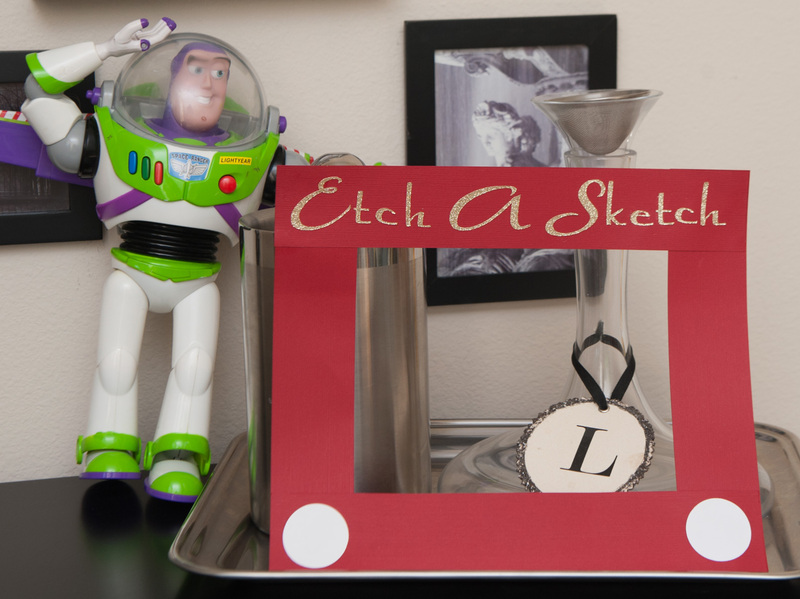 Attach your design with a Cricut Easy Press. 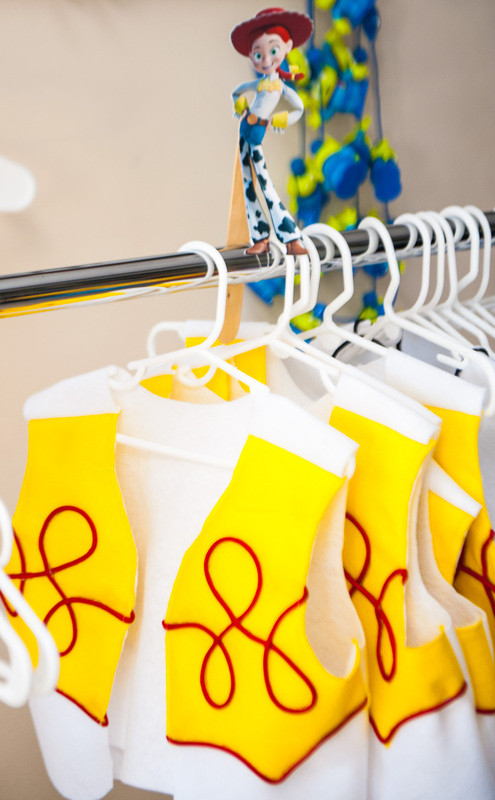 Find further instructions on how to make customs shirts for your party here. 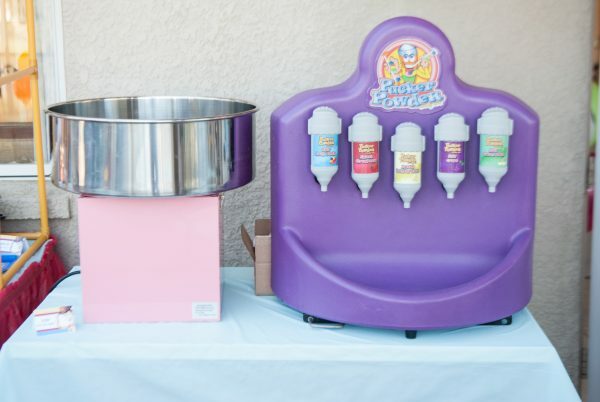 A true dream party for a child! The most amazing detail went into this party. Seeing the pictures certainly captures all of the creative components but being there and feeling the Magic of it all was truly an unforgettable experience. It is beautiful seeing your many talents illustrated through each and every tiny detail. Amazing job! Wow, this is one of the nicest comments that I’ve ever received! Thanks, Kelly… it makes all the hard work worth it in the end. This Party looks so Fun!! I’m pinning it for later Reference, thanks for sharing. Thanks so much Alyssa! We did have a lot of fun during this party. 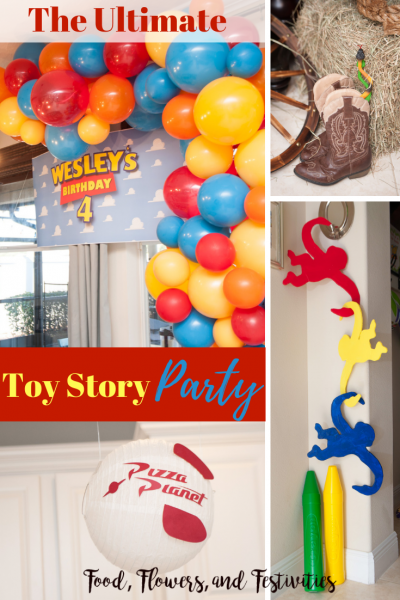 This Toy Story party was out of this world! 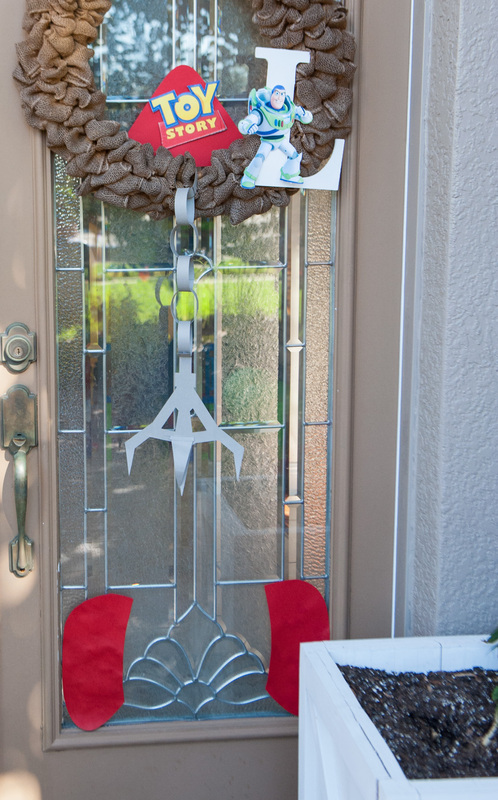 The attention to detail had such a wow factor from the moment you arrived at the door. The party was definitely planned with the kids and birthday boy in mind! 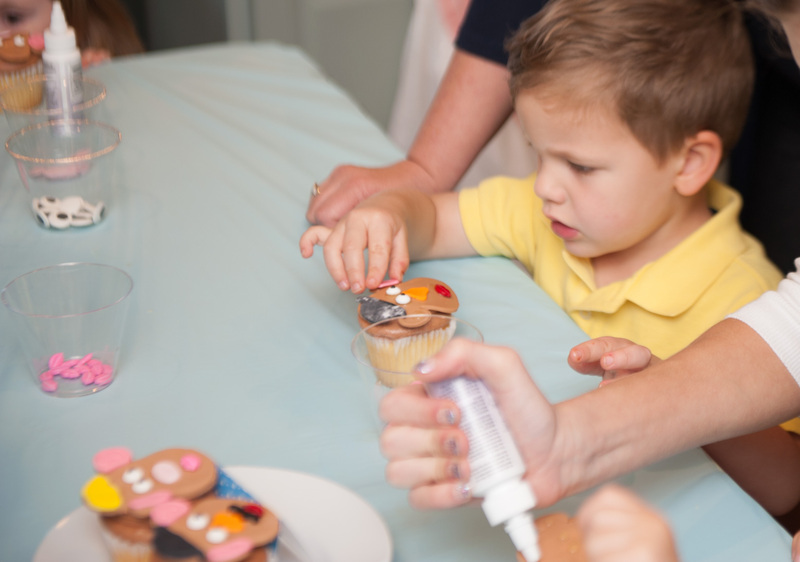 There were many excellent age appropriate activities arranged in a way to keep a constant flow and kids engaged the entire time. But then there was a whole other level of detail that most of the kids probably didn’t notice, but that could definitely be enjoyed and appreciated by all of the adults! I was truly in awe from the moment I arrived until the moment I left this party! The party was truly memorable! Wow, Andrea… what an amazing comment!! Thanks so much for your kind words. Party planning is my passion so I appreciate your comments. What a fun party theme. You thought of every single detail–so cute! Thanks so much Amanda! We had fun! I just realized I am a terrible parent- my kids have never seen a Toy Story! So obviously, we need a family movie night to catch up and I love those Jello cups with the eyeballs and all the other fun party ideas! Thanks Amber! 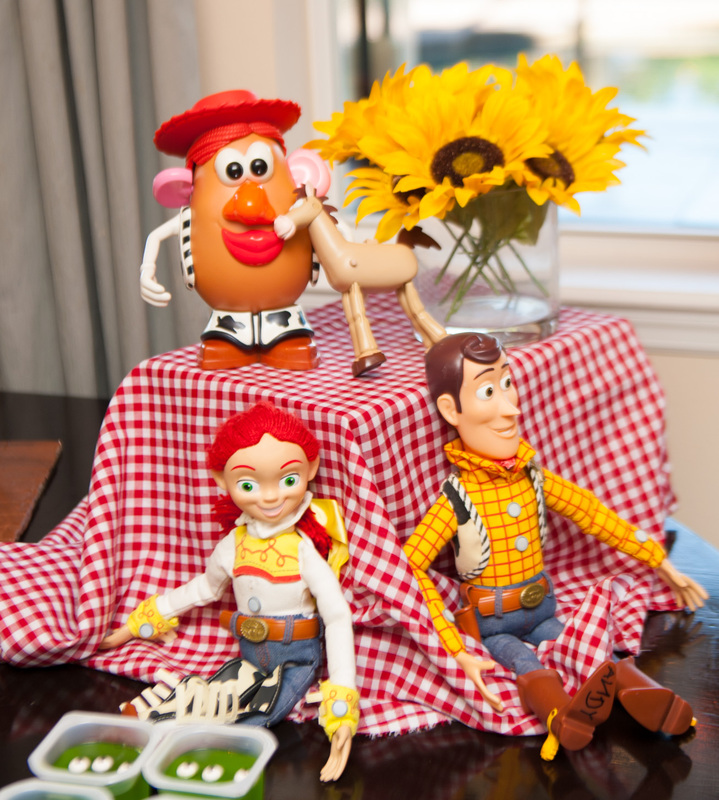 Toy Story is really cute and I think your kids would love it! We will probably do a Toy Story party for my son’s next birthday. 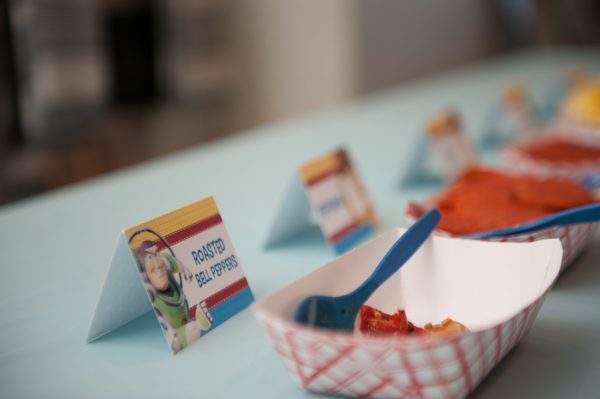 I especially love the Alien Jello! Thanks Tami! Toy Story makes a really cute theme for any party! 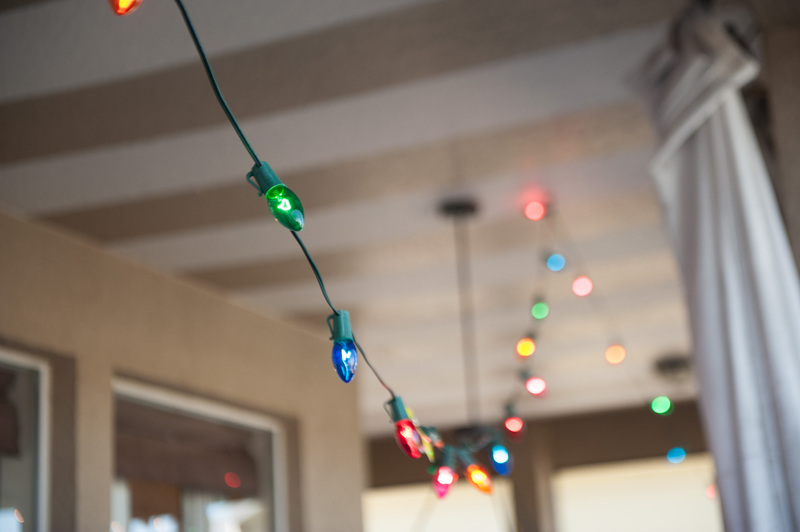 I hope I was able to give you some ideas. I am in awe! What a fabulous set-up. 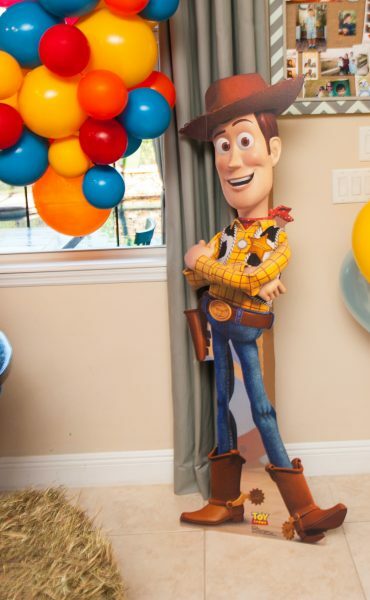 My 4-year-old is currently obsessed with Woody and would love something like this. Thanks so much Jori! My son is also 4 and loves Toy Story. Wow! This is amazing! 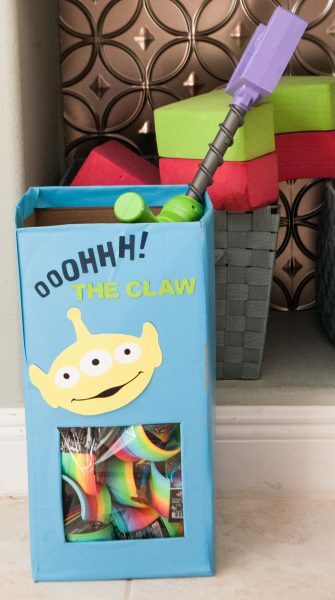 I love all the details like the alien claw in the bouncy house and wooden blocks. Party of the year! Pinning for later. Thanks so much MJ! 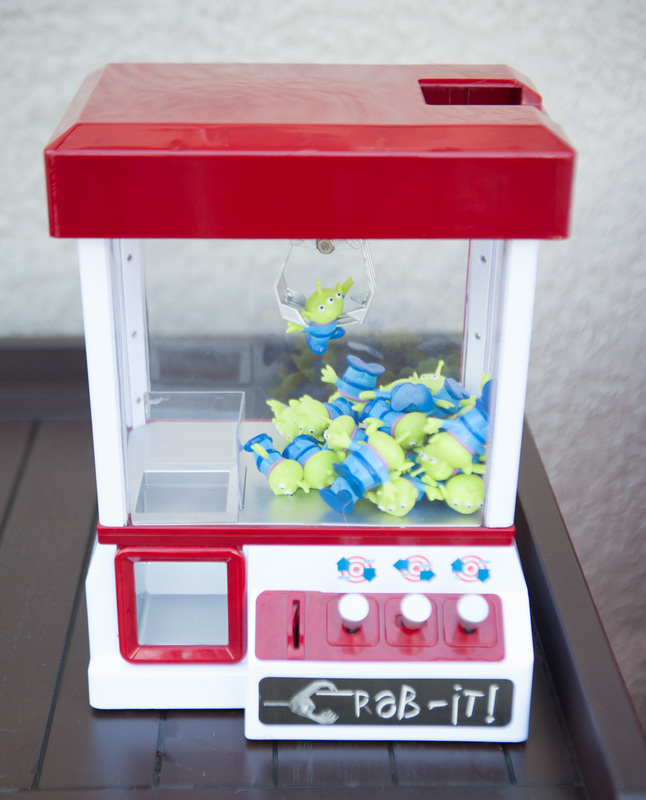 Toy Story has so many cute things to build upon. Thanks Tiffany! 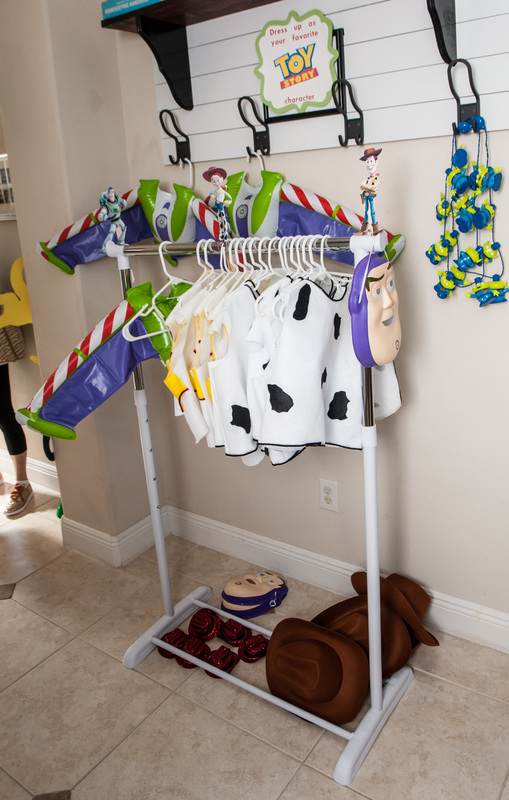 I think you should have an adult Toy Story party because it’s nostalgic for a lot of us. You are a party planning rock star!! This is beyond amazing! I say it every time, but I have NO clue how you put this all together yourself! If I didn’t know better, I would assume it’s a team of event planners that come in and put it all together. Details are insane! Kill it every time! Thanks so much Lori! You always write the best comments. I always have big ideas and then worry about the execution later haha. I have to admit that the night of the party I probably got two hours of sleep. This is a great theme! My girls LOVE Toy Story. 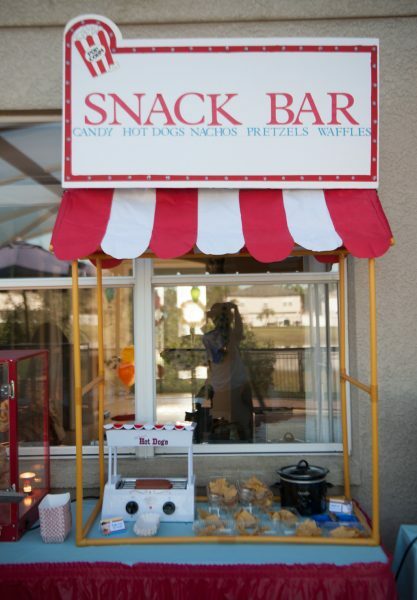 I’m going to suggest this one to them for their parties this year. Thanks Heather! 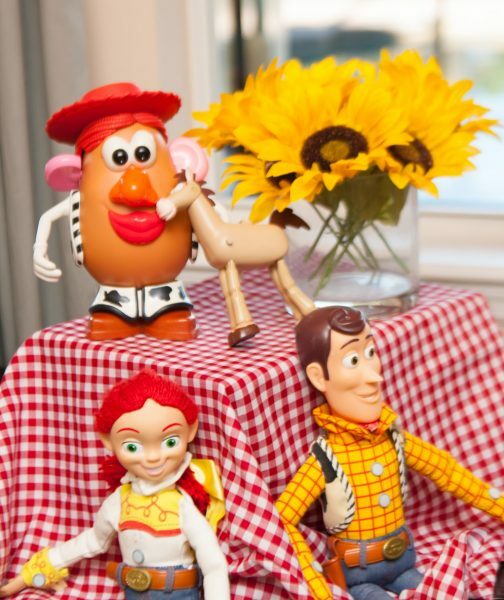 Toy Story was one of my favorite themes because you could do so much with all the cute characters!! This turned out SO cute! 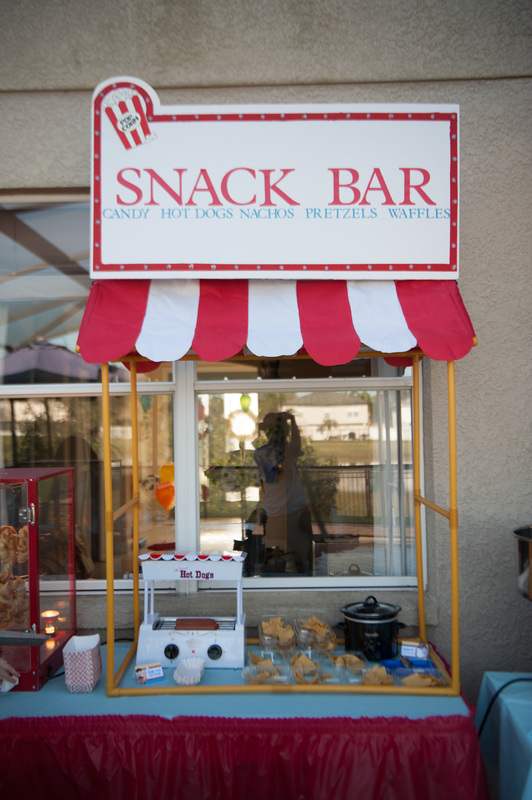 All the food and snacks are perfect. 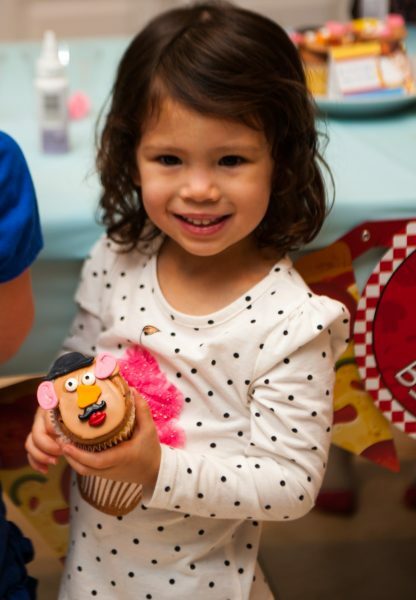 Oh my gosh, this is the cutest party I have ever seen! I love Toy Story!! Thanks so much Leigh! 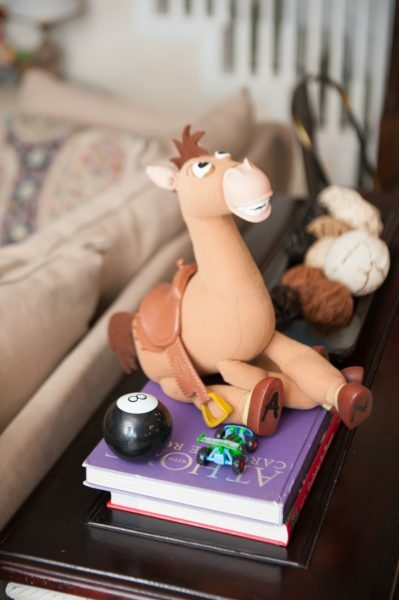 We love Toy Story too. We can’t wait for the new movie coming soon. 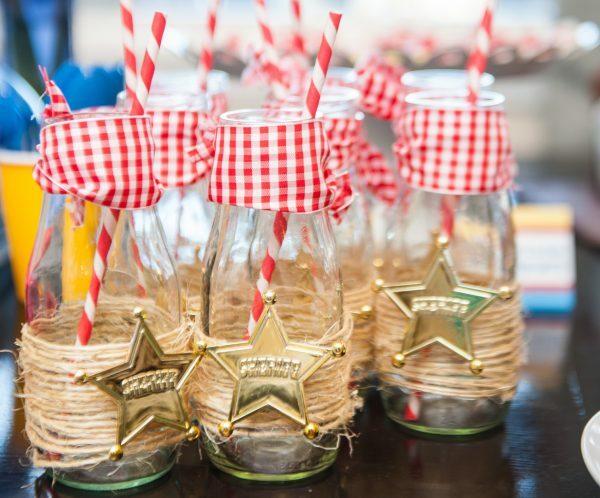 This is such a fun party theme. I love your balloon arch! Thanks Amanda! I will have a balloon arch tutorial very soon!